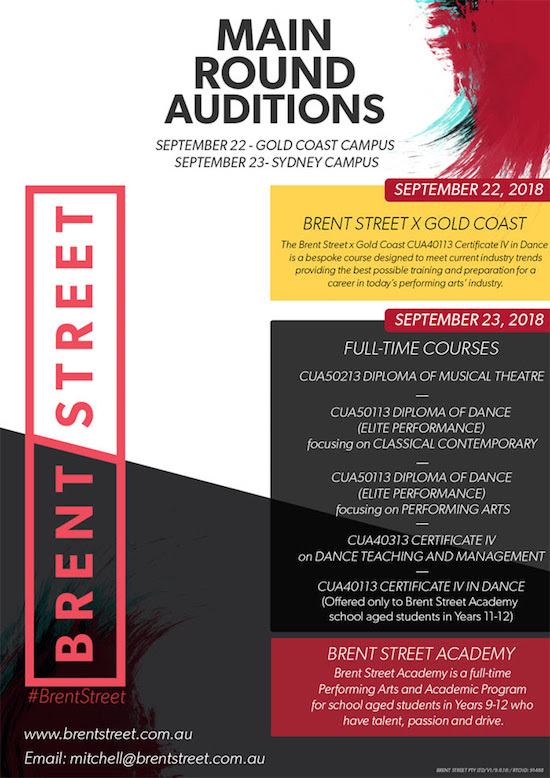 Brent Street has announced its Main Auditions for its Sydney and Gold Coast courses in 2019! The Main Audition for Full-Time 2019 Gold Coast is on Saturday, September 22. Sydney’s Main Round is on Sunday, September 23. If interested, dancers should complete the Audition Application Form (Click here to Download) and return to mitchell@brentstreet.com.au (along with your CV, Headshot and Full-Length body photo) by Sunday, September 16. Click here to download the 2019 Course Prospectus, which has a detailed breakdown of all the courses Brent Street will be offering in 2019, including prices, audition requirements and course information. While Brent Street prefers dancers audition in person, if they are unable to attend, they are welcome to organise an Online Audition. Simply select the “Online Audition” method at the top of the Audition Application Form. The same deadline of September 16 applies to these applicants. For more information, visit www.brentstreet.com.au.